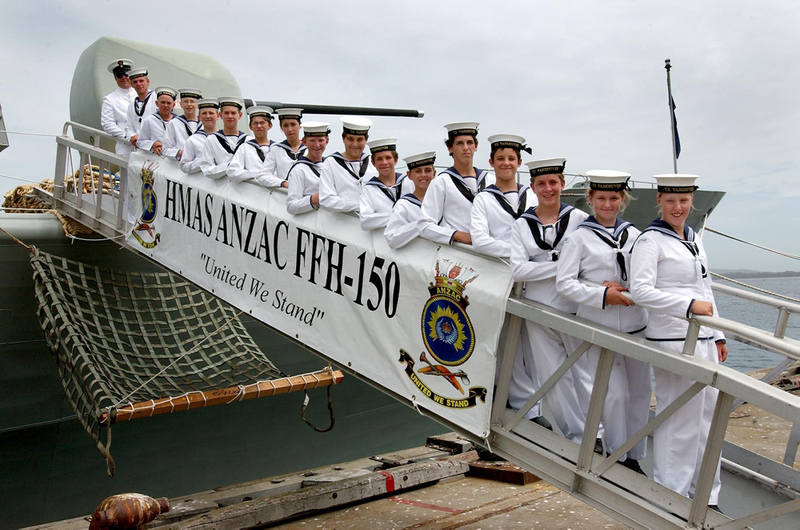 Australian Navy Cadets on the gangway of HMAS Anzac. To learn more about The Australian Navy Cadets please visit www.navycadets.gov.au. The Australian Navy Cadets (ANC) is a leading provider of youth development experiences. The ANC is sponsored by the Royal Australian Navy and aims to build leadership skills in young people through adventure and exciting learning activities. Becoming a Navy Cadet means making new friends, being part of a team that values you and experiencing challenges that will develop your potential as a leader. Adventure and fun are the key ingredients for all camping, water sport and team challenge activities. Navy Cadets learn how to sail, navigate and gain skills in everything from IT, communications, cooking and first aid to drill and seamanship. Becoming an ANC Staff member is equally challenging and rewarding. Cadet Officers and Instructors are volunteers with a keen interest in working with young people. ANC Staff are highly respected members of their communities who undertake comprehensive training in youth leadership and safety management to become Unit leaders. The ANC is a growing organisation with 91 Cadet Units called 'Training Ships' around Australia. The ANC is continually evolving to meet the needs of Australia's youth and community expectations. The life skills that Cadets learn complement their academic achievements and stand them in good stead for rewarding careers. Many former Cadets return as ANC Officers and Instructors to pass on their knowledge and experience to inspire future leaders. Explore this web site and learn more about how joining the Australian Navy Cadets could be the best thing you have ever done. Just add water for fun, adventure and friendship. Navy Cadets have oceans of it! The Australian Navy Cadets (ANC) is a leading provider of youth development experiences. Navy Cadets reflect the Royal Australian Navy's values of honour, honesty, courage, integrity and loyalty. Cadets and ANC Staff are highly valued in their communities for their commitment to good citizenship and in many areas they are the only uniformed presence to promote Navy as a strong community partner. Adventure and fun are the cornerstones of cadet activities and the Navy has overall responsibility for the efficient management of Cadet Units and safety. Under the CADETSAFE Program, ANC Staff conduct safety assessments and management practices in line with mainstream Navy programs. Cadets and Staff attending authorised training activities are fully covered for worker's compensation. Not a member the Australian Air Force Cadets or Australian Army Cadets. Cadet activities centre on learning seamanship through sailing, boat handling, marine engineering and communications to mention just a few exciting experiences. Some Training Ships have a band and there are opportunities for Cadets to parade and perform recitals at community events. Cadets attend training on one night each week and one day per weekend. They can also attend camps on weekends and during school holidays. Some of these activities involve travel and there may be opportunities to represent Australia at international Navy Cadet events. The ANC is not part of the Australian Defence Force (ADF), nor does cadet membership obligate a person to become a member of the ADF. Staff are appointed by the Director, Australian Navy Cadets after undergoing interviews, police checks and a psychological assessment of their suitability to work with young people. In addition, voluntary Staff may be appointed for specific duties by Senior ANC Officers. Cadets are supplied uniforms free, on loan from the Navy. Uniforms include complete summer and winter ceremonial dress and working uniforms including items such as protective clothing and boating wear. All ANC Training Ships are required to have a Unit Committee. This Committee is made up of the parents of Cadets and other interested people from the community. The Committee's main role is to provide and maintain facilities and equipment not supplied by the Navy. An active and successful Committee is vital for a Unit's success and parents are encouraged to become involved in fund raising and helping to organise activities. Each Unit differs and some charge a joining fee, a per-quarter fee and a parade levy on training nights. Weekend activities, where meals are provided by the Unit, will normally incur a small cost per meal. Activities where meals are not provided are usually free of charge. Also where training courses are conducted by outside agencies, such as the Australian Red Cross and the Australian Yachting Federation; costs are borne by parents. However, these fees are generally at a lower rate than is normally available. Week-long camps known as ACTs (Annual Continuous Training) also incur a fee. For more information about activity fees contact your local ANC Unit. There are more than 2400 Cadets and in excess of 450 Staff across Australia in 97 Training Ships. Many ANC Training Ships are located in isolated or inland areas where the ANC provides the most visible link between the Navy and the community. The ANC has had a long and proud history since it was recognised under the Naval Defence Act in 1910. Until 1973, they were known as the Sea Cadet Corps and were jointly administered by the Royal Australian Navy and the Navy League of Australia. At that stage, the Navy assumed full responsibility for the Corps and renamed it the Naval Reserve Cadets. The Australian Government review, 'Cadets The Future' recommended a final name change to Australian Navy Cadets in 2001. Annual Continuous Training (ACT) being conduction at Leeuwin Barracks by the Australian Navy Cadets (ANC). Note: This video is hosted on YouTube. Department of Defence users will not be able to view this video on the Defence Restricted Network (DRN). Australian Navy Cadets may have opportunities to travel to countries involved in the International Sea Cadets Association (ISCA) exchange program. Navy Cadets have travelled to some of the 19 ISCA member countries such as America, UK, Europe, Africa, India, Asia, NZ and the Caribbean. Each year Navy Cadets may have the opportunity to visit similar cadet organisations overseas and to host cadets here in return. The new friendships, visits to interesting and scenic localities and different cultural experiences are memorable. The exchanges concentrate on promoting goodwill, fun, social contact and learning about new places and seeing how other cadet units operate. All Cadets going on exchanges are accompanied by ANC Officers and Instructors. The trips are well organised to ensure that the experience is fun and educational. Cadets need to be over 16 (unless specified otherwise) at the time of the exchange to participate, be in good health, be responsible and well presented and have demonstrated a solid contribution to their own unit. Application forms must be signed and endorsed by your Commanding Officer. Fees are charged for exchanges and passport applications are at your own expense. Where are the latest exchanges? Exchange locations and dates are advertised as they become available. Each exchange will have selection criteria to meet and will have a cost. Fees will vary from country to country depending on air travel prices. All accommodation and internal travel will be arranged by the host country. Where possible fares will have a concession applied if the exchange can be sponsored by external sources. Spending money is the responsibility of individual participants. Dates are programmed around Australian school holidays as much as possible to correspond with the northern summer school breaks.